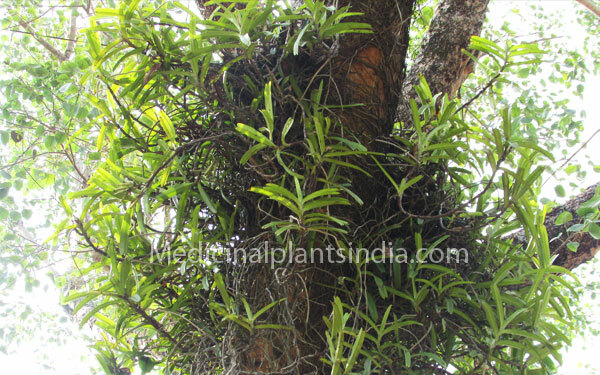 Acampe orchid is a stout, grow 20 to 50 cm high, it is a type of wild orchid found throughout Kerala, in moist deciduous forests, plains and Western ghat areas, it grows as a parasite on trees, rocks etc, like any other orchids, a monocot, the stems are woody, up to 50 cm long. The leaves are pale green, fleshy, up to 20 cm. long, oppositely arranged, flowers found in the leaf axils, commonly found in clusters of pale yellowish, fleshy, 2 cm across and sweetly scented, flowering and fruiting period is March to April. Used as an anti-typhoid, treatment of rheumatism.